I have a similar problem with my "Five best Kazoo players" list. Somewhere in Sgt. Pepper and a Queen number, I remember, but my mind don't work so swell no more. Maybe Spike Jones? Maybe a top kids TV show featuring puppets in the late 40s early 50s? Jon Anderson is a consummate tambourinist. There is only one. Airto Moreira gets more music out of a pandeiro (Brazilian tambourine) than many drummers do out of a whole kit. Turn it up and check out his badness! Once again, I gotta nominate a great punk/indie musician from the Pacific Northwest: Emily Nokes of Tacocat. Susan Dey "played" electric piano on The Partridge Family... Suzanne Crough "played" tambourine. 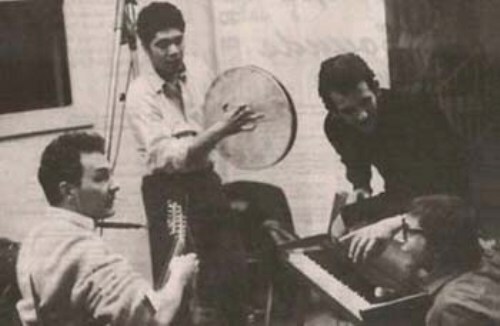 here he is with fred neil, felix pappalardi and jack nitzsche...good crowd!! I'm surprised that this thread hasn't been split into skinned and open frame tambourines. What's next? Accordions? Kazoos? Swinettes? Get out of my teenage fantasies!!! The best tambourine player of all is, of course, Joel Gion of the Brian Jonestown Massacre. +1 for Jack Ashford of The Funk Brothers. You've heard him on scores of Motown records from the early and mid-60s. EDDIE BRIGATI w/The Rascals gets my vote. Here he's pulling double duty... tambourine in one hand and maracas in the other. Btw: how he did the 'gonna smash that gong'-thing was brilliant!